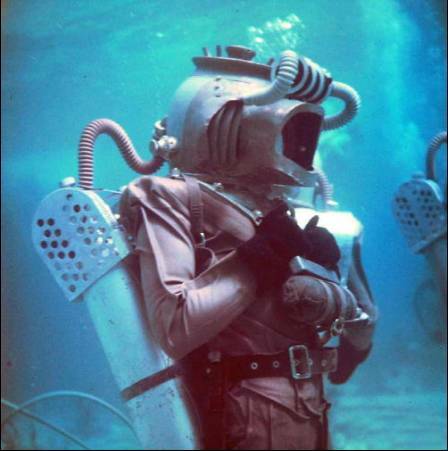 In 2002, the first Nemosuit featured a gray rubber drysuit made by Ty Alley (Aquala Sports Manufacturing Company). Ty already had the gray rubber in stock for a “commercial” suit he produced, so there were no surprises there. 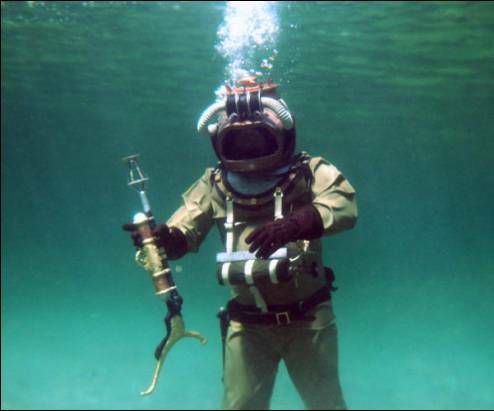 But when we went on to build a functional replica of the Nautilus Crew Diver’s rig, it wasn’t so easy. First of all, what color were those suits, anyway? I hadn’t seen them since Disneyland: when I was a kid in the mid-1950’s. At the 20K Exhibit, they had ‘em on display exposed to the air, under harsh lights, and coated with something like shellac to make them look wet. I remember thinking that they looked like they were shriveling up and rotting away. Turned out that’s exactly what ended up happening. So, decades later (when we wanted to replicate them) there were no actual examples available to study. As best we could tell at the time (with the paucity of pics and info available back in the day) the suits were some shade of green. And hey! 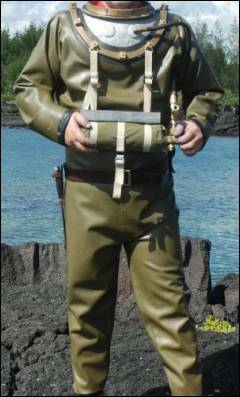 Ty already had some green rubber in stock for his “historical” drysuit line. 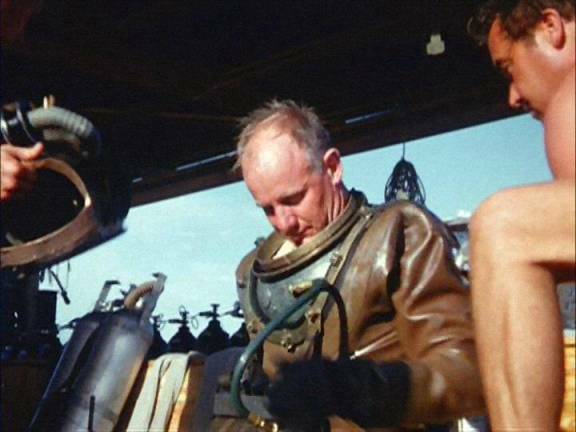 So the first functional replica of the Disney Crew Diver rig had a drysuit that was green: very, very green. But what the heck? We were still developing this as we went along, and all we needed to do was contrast the Nemosuit, right? Well, yes and no. 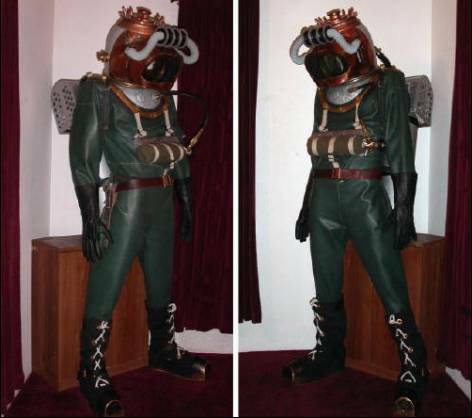 So, Mr. Alley got together with his rubber supplier’s chemists to produce a new material in olive green, which he used to construct the Nautilus Crew drysuit I dove for Operation Undersea Two in 2007. But then: when trying to determine the right shade of brown, I ran into even more problems. During the “dry” scenes, the crew suits exhibit almost chameleon-like capabilities: changing colors from scene to scene, and sometimes right before our eyes. 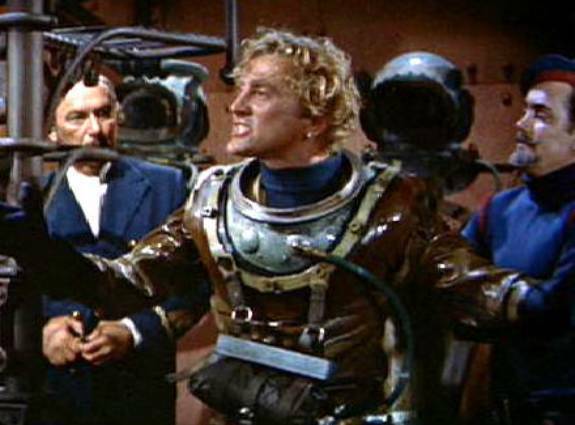 Compare the color of Kirk’s sleeve to Pete’s drysuit. So, with graphic references ranging anywhere from olive green to deep (nearly auburn) brown, we had a hard time deciding which was generally correct. It took a bit of research, but I finally nailed it down to a color sample we submitted to Ty’s supplier. 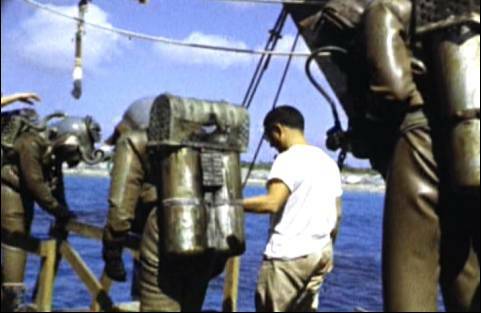 The following photo of Al Hansen (aboard the Disney dive barge back in ’54) is one good example of how an original drysuit looked in direct sunlight; and that medium dark brown is what we decided to recreate. NEW! Sunday, May 13, 2012: Here’s the first pics of our new Crewsuits. These were both taken with a digital camera on automatic settings. I don’t think it’s ideal for color representation purposes, but it’s the best I’ve got for the moment. This picture was taken without flash. And this one was taken with flash. As if figuring out the suit color wasn’t hard enough, now I find myself having the same problem trying to represent it with a color photo. The suit looks different with different lighting and camera settings; but then, that’s just like the originals were. This is just a quick teaser because I wanted to get some pics of the new suits up online. We’ll be shooting a lot more pictures of these suits, outdoors and underwater, in the near future. NEWEST!! 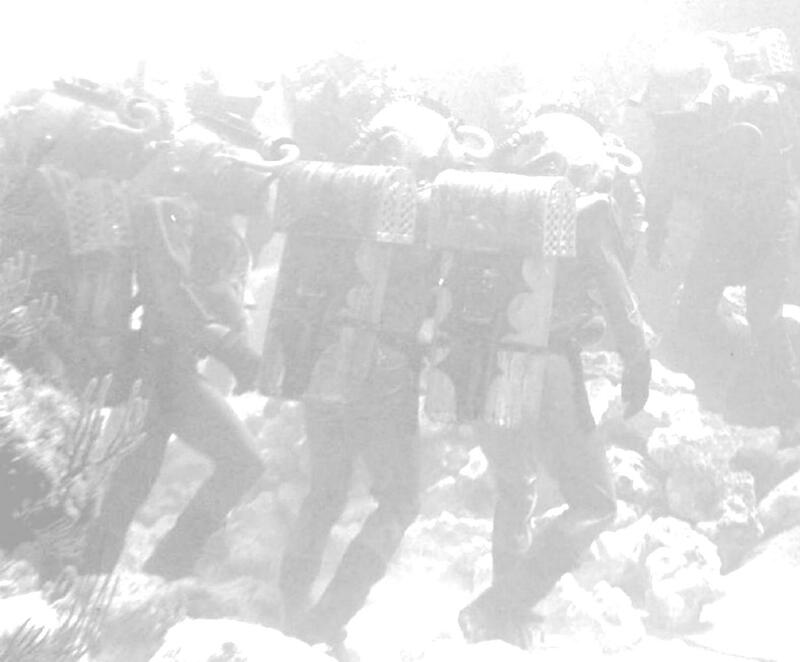 Friday, May 18, 2012: A continued examination of the Crew Diver Suits under varying light conditions. LIFE Magazine photographer Peter Stackpole shot this photo on location in the Bahamas, early 1954. I’m guessing the depth is about 15 feet. Notice how much of the brown color has bled out. Take it down to 30 feet (where they did most of the filming) and this suit looks green. With increased depth: red is the first color to go; and red is a major component of brown. 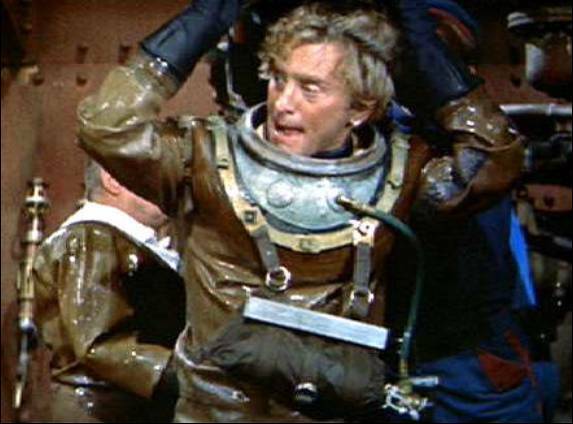 That’s why our olive green suit looks “authentic” (as seen in the movie) in shallower water: it’s already pretty close to the right color for underwater photography. 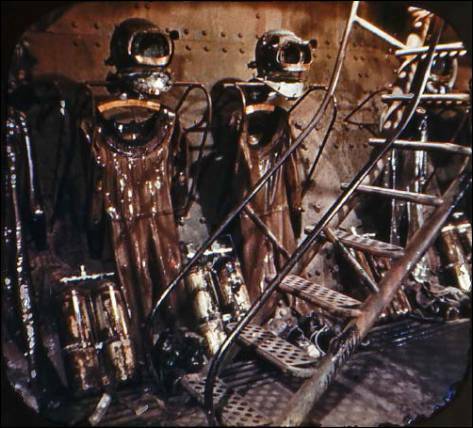 But with the Crewsuit, we wanted to replicate the original, authentic, Disney Nautilus crew diver suit as best we could. 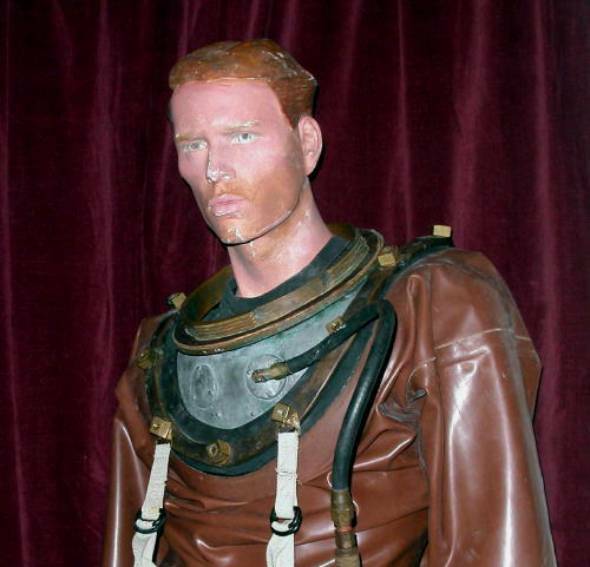 To do that, I felt our Crewsuit would have to look at least close to the original under varying light conditions. 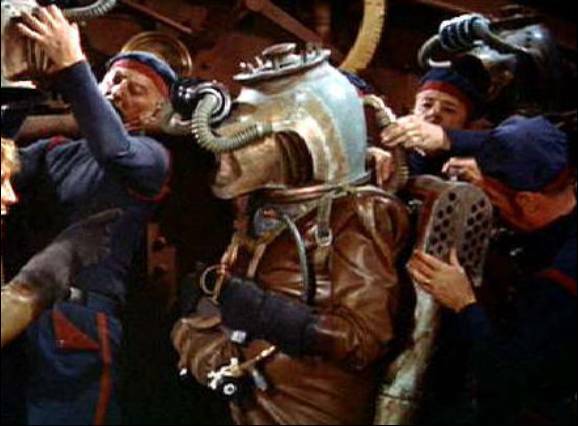 With that in mind, consider this cropped (but otherwise not enhanced) screengrab of Peter Lorre suited-up in the Nautilus Outfitting Room. Indoors; 35mm movie camera; Cinemascope and Technicolor; theatrical lighting; dark background. Indoors; digital camera / automatic settings; direct flash; light background. In contrast, (sorry!) consider the next picture. My color perception is good enough to pass the FAA Class One medical exam for Airline Transport Pilots; and to my eye, this is a pretty good representation of how the suit actually looked at the moment the photo was taken. IMOHO, in this particular example, the camera did an accurate job of reproducing how the suit color actually looks in the normal lighting conditions of the Vulcania Submarine shop. Indoors; digital / automatic; afternoon daylight via windows and doors; fill-in direct flash; varying background. Okay. 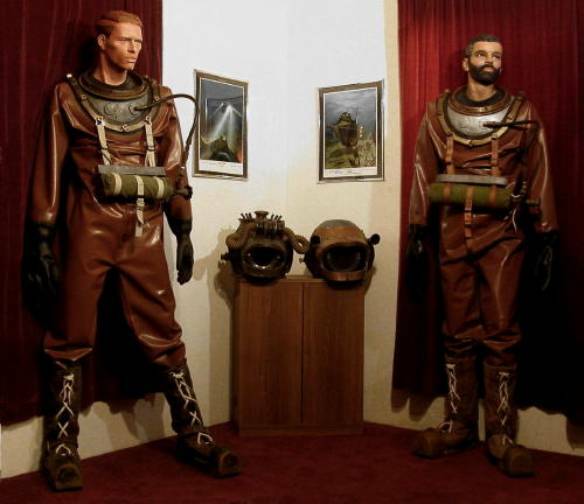 “We gots da brown suits.” Our inventory of functional replica 20,000 Leagues diving equipment is complete. That’s the message. No need to beat a dead horse. 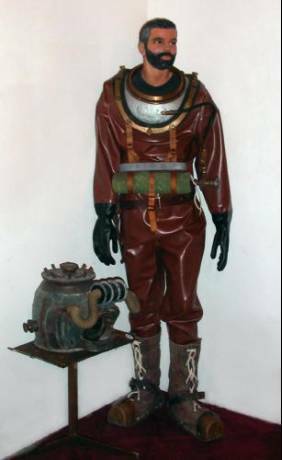 Next, I’m going to make some airtight bags and get the new Crewsuits into protective storage. After that it comes down to priorities. Might dive ‘em for the cameras; or might just wait until we’re ready to put the suits and the sub in the water together for the documentary. Time will tell.